One of the most unique accounts of alien abduction comes to us from the Ilkley Moor in Yorkshire, England. The witness and subject of this case is a former policeman named Philip Spencer. 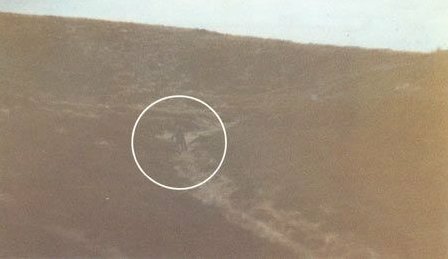 Spencer claims that in the early morning of December 1, 1987, he was taken aboard an unidentified flying craft, and after his release managed to snap a picture of one of the alien beings. The Ilkley Moor is very much as you would picture it. Reminiscent of the setting of the moors of Baskerville Hall in Conan Doyle's "Hound of the Baskervilles," it is an eerie place. It has been said that "The Ilkley Moor can scare you to death during daylight, and at night it's even worse." After four years of being a policeman in another city, Spencer had moved his wife and child to the Yorkshire area to be closer to her family. He was walking across the moor on this December morning heading for his father-in-law's house and on the way was hoping to get some photographs of the strange light tricks of the moor. To be able to get the images he desired he was using a high ASA rated film to compensate for the poor light in the area. It then ran away. Spencer gathered his wits and took off in pursuit of the being. Today he says he doesn't know why. It was just an impulse reaction. He arrived just in time to get a glimpse of a flying craft with a domed top rise up from the moor and disappear into the sky. Atop the dome was a whitish square. He was not able to get a photograph of the object. Hough knew what he was hearing was a "too good to be true" case, and it worried him, but after meeting Spencer, he was convinced that he was a man of integrity and was not seeking fame or fortune for his picture. There was no reason to not believe what Spencer had told him. Hough began a thorough investigation. The film with the alien picture would be the first thing to undergo professional scrutiny. 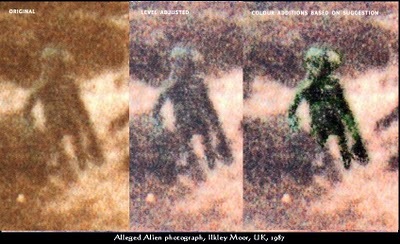 The alien picture was first looked at by a wildlife photography expert. The object in the image was not an animal of any known kind. It could not be determined either way if the figure was animate or static. A reconstruction of the original site did establish the alien's height at or near 4 and one half feet. He stated that the slow film speed used for the low light conditions made the film too grainy for proper testing. "I had great hopes that this case would prove definitive. Sadly circumstances prevent it from being so," Maccabee stated.